First off, why go to Austin, Texas? When to go? Anytime is good except for the summer months unless you like 110 degree weather. Spring and fall are beautiful. Location, Location, Location! It is the Croc mantra on food trips. We don’t like being isolated, even if the property is beautiful and luxurious. And we like a reasonable price in our hotels, so we have lots to spend on what really matters in a food trip…food and drink! So check in at the Driskill hotel, a historical landmark built in 1886. Chock-full of old world grandeur, with an expansive lobby and posh bar with leather chairs, piano player, the whole nine yards. Best yet, the Driskkill is right in the middle of all the action. 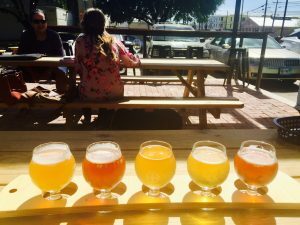 Lazarus Brewing- Great brews, espresso, tacos with a super-chill vibe. The 85 degree sun felt magnificent after running from chilly Philly. Tamale House- a great place to visit for authentic Mexican food after visiting Zilker Brewing. 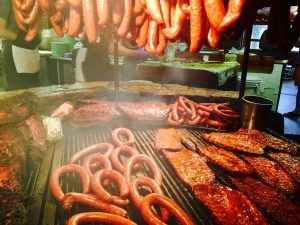 Saltlick BBQ- Situated about 20 minutes outside of Austin on acres of beautiful land dotted with live oat trees and blue bonnet flowers. Inside a roaring fire-pit heaped with various smoked meats- briskest, sausage links, spareribs, and turkey. The service is friendly and that fire pit will blow your mind. BBQ Food trucks- Austin locals stand in line for hours. We are not going to stand in line for hours. We have to many places to visit. Super-popular BBQ restaurants in the heart of town. (Franklins, Cooper’s, Terry Black) Once again you are going to wait for hours. 6th street- a rowdy and eclectic mix of bars and live music. At night the traffic is blocked off for bar hopping. Go to Pete’s Dueling Piano Bar where musicians’ engage you on stage, joke, and play songs by request. Luckenbach- the mecca of Texas country music made popular by Jerry Jeff Walker way back in the 1970s when he recorded the album Viva Terlingua. There is no town, just a post office, general store and a little stage where local country bands play. The place resembles an old western movie. Boots & Cowboy Hats- go to Allen Boots, to pick up legit cowboy boots and hats. Wall-to-wall selection of boots from ostrich, to snake skin, to classic raw hide. You can smell the leather all the way out to the street! Fredericksburg- the streets are lined with quaint little shops, where you can find more cowboy hats. Visit a chic art gallery and wine bar called Dan Pfeiffer. Generous pours of quality wine. Yes!! Barton Springs- a beautiful park and natural pool, a favorite of the locals. Rent municipal bikes to explore the park, which connect to the famous Lady Bird Lake. Enjoying some brews from Lazarus Brewing. Some of the best barbeque comes from Austin! Kurt in the beautiful Barton Springs!